In an era where a legendary co-sign means everything, Jay Rock’s Follow Me Home may have just received the end all be all of co-signs. Sitting in for a listening session, West Coast legends Dr. Dre and Snoop Dogg gave Follow Me Home their personal stamp of approval. In the brief video, Dr. Dre and Snoop Dogg can be seen nodding their heads to some of the biggest jams featured on Follow Me Home. Dr. Dre goes on to tell fans to pick up Follow Me Home, even going as far as holding up an official Follow Me Home poster. “You have been stamped. You have been approved, now go do what you do”, says Snoop Dogg while listening to the album. 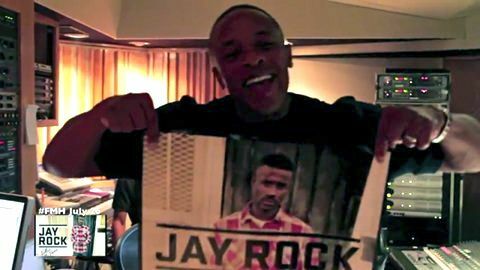 Fans may recall how Jay Rock spent time in the studio with Dr. Dre during the mixing of Follow Me Home. It looks like all of the hard work paid off for Jay Rock because he’s been given a pair of royal co-signs from the kings of West Coast rap. What do you think about Snoop Dogg and Dr. Dre signing off on Follow Me Home? What does this mean for Jay Rock? Will we hear him on Detox? Leave your thoughts below!